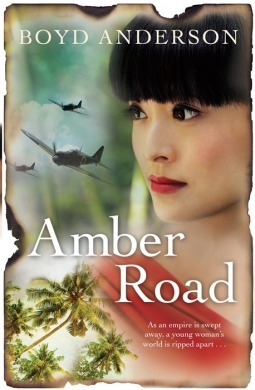 Amber Road is an historical romance set during WW11, against the backdrop of the Japanese invasion of Malaya and Singapore. The heroine is a gorgeous young Peranakan, Victoria Khoo. But who is her hero? She would like it to be Sebastian Boustead, a handsome and wealthy Brit, but unfortunately for her at the novel’s opening he has just become engaged. Meanwhile, the reader can see at once she should be hankering after Joe Spencer, an Aussie, who is slightly rough around the edges, but who understands her in a way that Sebastian does not. I don’t think it’s giving anything away to say Joe and Victoria eventually get it together, but do they keep it together? Will they get their happy ending? To find out the answer, you’ll have to read the novel, all I’ll say is I was rooting for them, and the ending wasn’t quite what I’d expected. Given that the novel’s central triangle concerns people of three nationalities, you’ll probably immediately gather that Amber Road is ambitious in its sweep and scale. The characters include Chinese, Japanese, Peranakans (Straits born Chinese), Indians, an English woman disguised as an Indian, communists, capitalists, servants, masters, children and the very old. The novel, like one of its main settings, Singapore, is a melting pot, and Anderson skilfully explores contrasting cultures and concerns, sometimes even within one family, as when Victoria expresses discomfort at her own father’s polygamy – he has two wives, and two families. Anderson’s characters’ personal stories unfold against dramatic world events, and as South East Asia is in turmoil; he seems to have undertaken meticulous historical research. This never becomes intrusive, but the wealth of detail enables him to evoke place and period with what feels like great authenticity. He is very good at conveying the chaos, the deprivations, and the fear of the Japanese occupation of Singapore, an atmosphere of suspicion and tension perhaps best summed up for me in an incident where Victoria’s much younger half-brother betrays his own family by informing the Kempeitai, the Japanese secret police, that they have hidden in their house an illegal radio. Thanks to Anderson’s research, I learned from his novel all sorts of interesting historical facts, for instance about the opium trade in Singapore prior to WW11 – a trade about which I previously knew nothing. Reading the novel has also made me determined to take a walk along Amber Road, which is a real road in Singapore, and which was once lined with beachfront mansions belonging to wealthy families. One of the mansions was clearly the inspiration for Anderson's Angsana Lodge; a house that has such importance for Victoria’s fantasy life it could almost be a character in its own right. Amber Road is a big, generous romance that blends derring-do adventure, suspense, and tragedy. It has characters you’ll care about, and it conveys both a compelling sense of place, and of period. I highly recommend it. Amber Road is published in Australia by Random House, and in Asia by Monsoon Books, a company based in Singapore. It is available in print and e-book formats. If you have read it, please post with your opinions.